Was Turkish Journalist Ahmet Sik Working on a Piece that Would Cause Upheaval in Erdogan’s Ruling AKP Party? FreePress, a blog published in Europe, posted comments from a colleague of jailed journalist Ahmet Sik and brought some new details to light. Alican Uluda works with Sik at Cumhuriyet, a daily newspaper the Erdogan government considers an opposition publication. He has continued to criticise the stance of the current government about the Kurdish issue and the Syrian crisis. I believe the real reason behind his detention is something else, although it is said that the reason is his criticism. He was so close to reaching all the details required for the piece. My opinion is that his tweets aren’t the reason for his detention. The real goal is to prevent him from publishing the piece he has been working on. If the piece was to be published, there would be an upheaval within the ruling party (AKP). 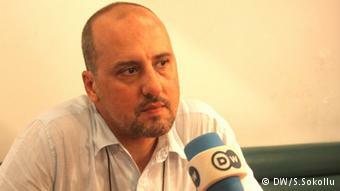 Ahmet Şık, who was put in jail for an unpublished book in 2011, has now been arrested for a piece he has not yet written. Sik is indeed one of Turkey’s most famous investigative journalist. The 2011 incident Uluda mentions involves a book he wrote on the Gulen movement, The Imam’s Army. Ironically, it was the Gulenists who orchestrated Sik’s incarceration. This entry was posted in Turkey and tagged Ahmet Sik, AKP, AKP Party, Cumhuriyet, Erdogan, Gulen, Gulenists, Jailed Journalists, journalists, party, The Imam's Army. Bookmark the permalink. 1 Response to Was Turkish Journalist Ahmet Sik Working on a Piece that Would Cause Upheaval in Erdogan’s Ruling AKP Party? You might remember the Gulen movement being deeply involved in Ohio charter schools.